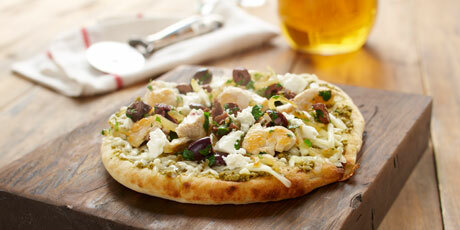 With strips of chicken, pesto, olives and feta, this pizza will make you feel like you're in the Mediterranean! 1. In a large skillet, heat oil over medium-high heat. Add chicken and sauté for 5 minutes or until chicken is cooked and starting to brown. Add onion, garlic, olives, and parsley and sauté for 5 minutes. Remove from heat. 2. Pre-heat barbecue grill to high for 10 minutes. 3. Spread 1 tbsp (15 mL) of pesto on each pita. Divide chicken mixture equally between the four pitas. Top with mozzarella cheese and Krinos Feta Cheese. 4. Reduce heat to medium and place pitas on lightly greased grill. Grill covered for 5 to 8 minutes or until pitas are crisp and cheese is melted.